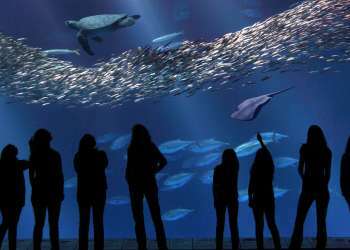 ’s breathtaking treasures. 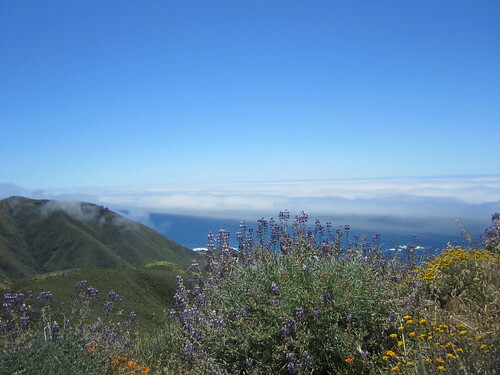 If you recall, my last excursion took me to Julia Pfeiffer Burns State Park where I trekked through the Tan Bark and Tin House Trail. 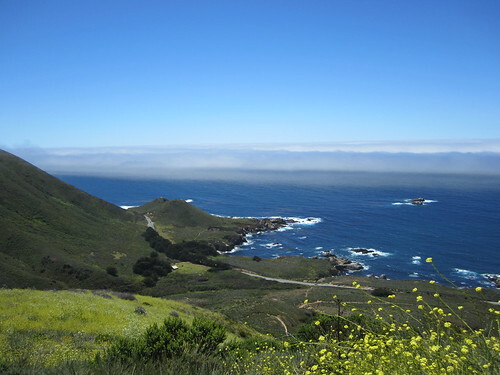 This time around I wanted to stay a bit more on the northern part of Big Sur. 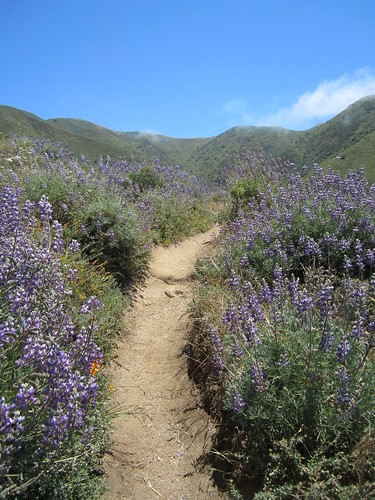 After doing a little research I decided on a locals favorite trail loop called the Rocky Ridge and Soberanes Canyon Trails in Garrapata State Park. As soon as I read that this park had views of both the Big Sur coast and Soberanes Canyon my mind was made up and a starting planning my next adventure! My hiking buddy and I left Monterey just after 12:30pm and after a very easy and scenic drive we arrived to Garrapata State Park just before 1pm. Signs for the park are not easy to find (I assume this is what makes the area a locals secret) so my companion and I had paid close attention to the turnouts and mile markers along the way. 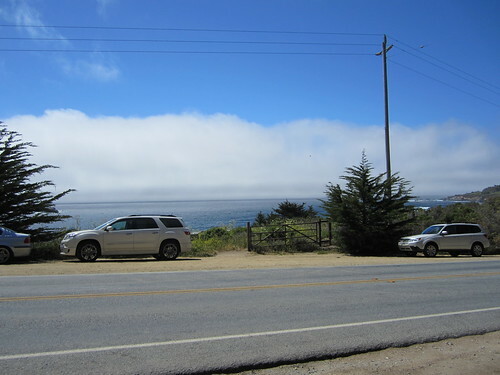 Once we came up to turnout 13 we parked the car on the coastal side of Highway One near a row of cypress trees. After walking (or should I say running) across the road we entered the gates towards the Rocky Ridge and Soberanes Canyon Trails. 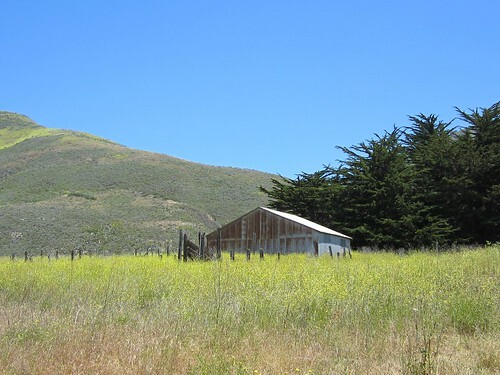 We crossed a small stream and continued towards a tin house sitting pretty in a field of yellow wildflowers. I thought these flowers were spectacular but little did I know what lay ahead. Make sure to take note of the blue porta- potty near the tin house; it is the only facility in the whole park. 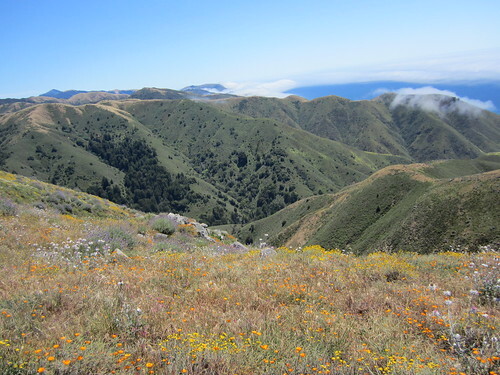 My fellow hiker and I decided to take the Rocky Road Trail to the top and loop down the Soberanes Canyon Trail having the best of both the coastal and valley views. Once on the trail I made the mistake of looking up and immediately realized I was in for a steep hike up to the top; luckily there were incredible views of the Big Sur coast barking sea lions in the background to distract my burning muscles as I climbed the never ending mountain side. 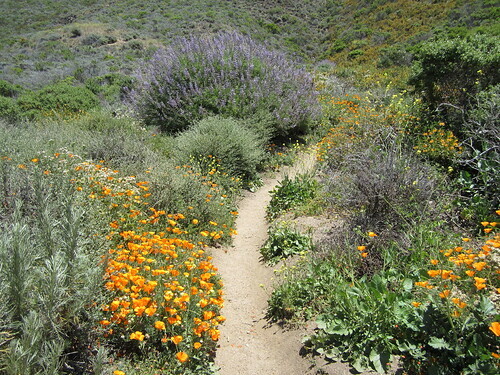 The most surprising part of the climb to the top was the kaleidoscope of wildflowers that blanketed the sides of the trails. I had assumed that the flowers had reached their peak in April-May but these babies were still in full bloom. I have never seen so many bushels of purples, oranges, yellows and greens. After the 1.5 hour long climb to the top we rested on the rock at the peak with epic views of both the rocky coast and the lush Soberanes Canyon. This truly made the 1,850 elevation gain worth it! Once we snapped some photos and felt rejuvenated it was time for the fun part…. getting down. The hike down, although much easier than going up, still had its challenges. The trail was still very steep and I was certain I would land on my dairy air at any moment; fortunately this never came to fruition. The descent downhill seemed to go quickly and it was rather enjoyable watching panting hikers going up asking “how much farther to the top?” Once down the hill we were blanketed by a vast amount of redwood trees that covered the canyon floor. The greenery provided the perfect amount of shade from the beating sun. The grounds resembled something from Jurassic Park, nothing like the colorful display just above. Various hues of green shrubs carpeted areas that weren’t occupied by the stream. 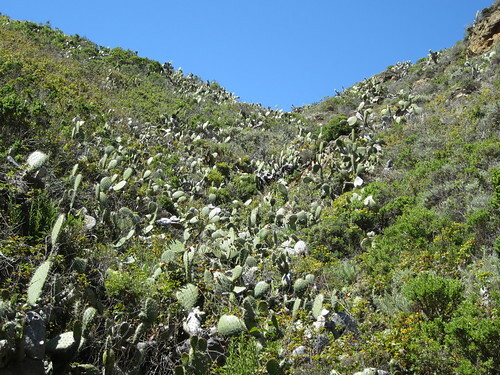 Even more surprising than the wildflowers being in bloom were the cacti that covered one side of the hillside. There were hundreds of these thistly plants! 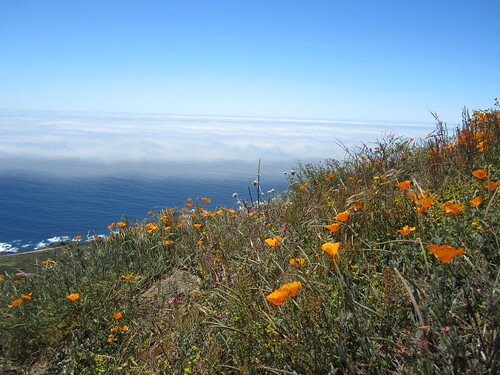 The seven-mile hike made for the perfect Big Sur escape. If you plan to go on this hike be sure to wear good hiking shoes with plenty of traction. Water is also a must as it can get hot out and you will sweat! 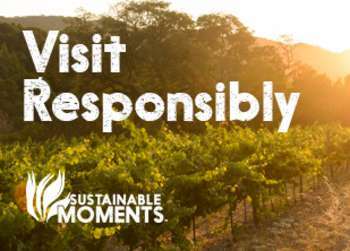 For other great day hikes in the area check out the "Top Ten Day Hikes in Monterey County."